If you're loking for water slide rentals in Dayton, Springboro, Kettering or surrounding areas, Dayton Inflatables is here to help. Let your guests cool off with these great slides in the hot and humid summer months? 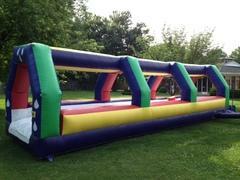 These great slides will be the hit of your next party or event with kids and adults alike. You can rest easy knowing that all of our water slide rentals meet or exceed all industry safety standards. Also, all of our slides are manufactured by the top companies in the contry. You can also be assured that all of our water slide rentals are cleaned and sanitized between every use. With attention to detail and customer service, it's easy to see why Dayton Inflatables is quickly becoming the area's top choice for all your bounce house and water slide rental needs. 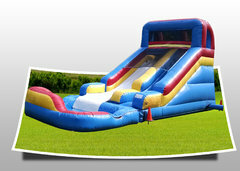 With incredible designs, these slides are not only safe and fun, they will also be the centerpice at your next event. Let these slides be the centerpiece of your event with their beautiful and unique designs. 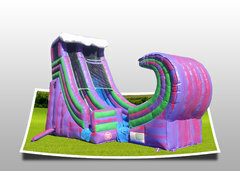 With our incredible selection of water slides, it will be easy to find the perfect fit for your party. 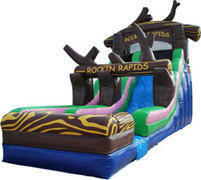 Invite your guests to take a trip down our 22' Rockin' Rapids Water Slide. With its beautiful design, your guests will feel like they're making their way down the New River. Ready to catch some waves? 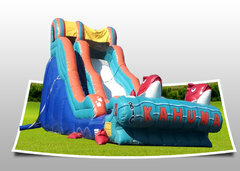 Then take a look at our Big Kahuna Water Slide. Complete with a giant wave up top and big fish at the bottom, this slide will be a huge hit at your next church event, company picnic or school field day. Looking for something that is appropriate for your smaller guests as well as the big kids? How about our Slide & Splash Water Slide? For hours of constant fun and excitement, you just can't beat our water slides. If you are having a tough time deciding between a water slide or a bounce house, feel free to take a look at our combo bounce house rentals that provide the best of both worlds. When it comes to the best selection of inflatable water slides, nobody comes close to Dayton Inflatables with selection and service. We proudly serve Dayton, Springboro, Kettering and other surrounding areas. Browse the selections below and click the image or title for more information and to request a quote. We welcome all questions, so please contact us for inquires and orders. Click below to book the best water slide rentals in the area!